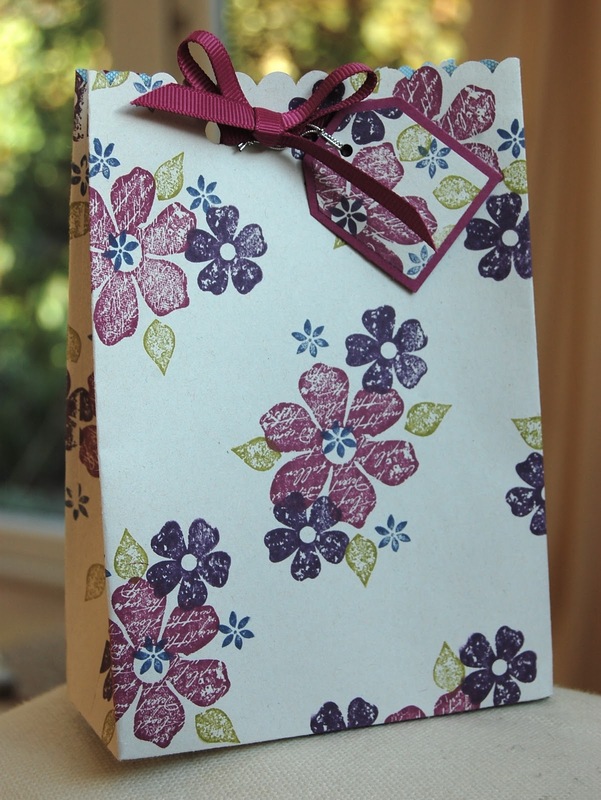 Stampin' Up ideas and supplies from Vicky at Crafting Clare's Paper Moments: A bunch of Bag-a-lopes! 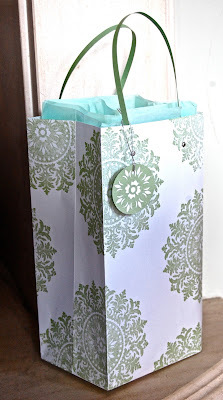 It's Bag-a-lope week on Crafting Clare's Paper Moments this week! 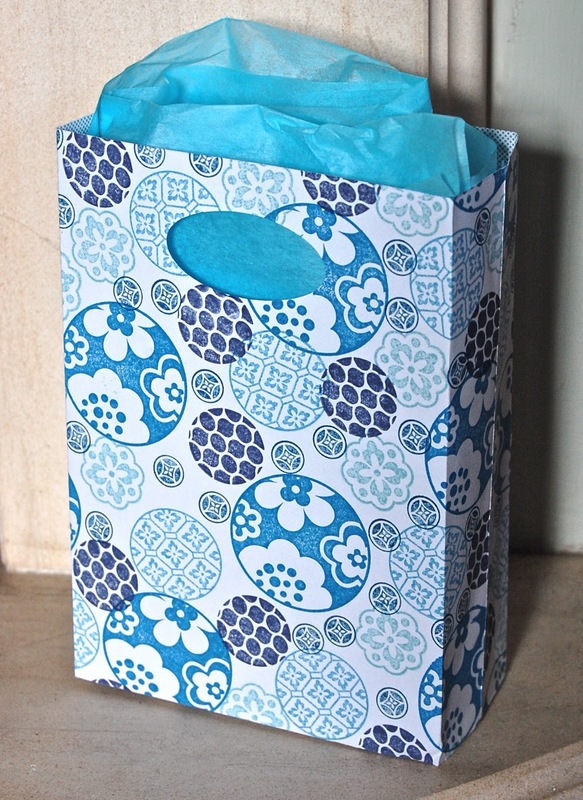 I've never stopped making these quick and easy gift bags, but a friend recently asked me to demonstrate them at her party so I've spent some time experimenting with new designs. Come and see! I gave instructions on how to make the basic bag in this post. For the bag above, I scalloped the open edge with my scallop border punch once I'd chopped off the sticky part of the C5 envelope. I used Vintage Vogue for the design along with the tiny flower from Season of Joy - those tiny flower stamps are always so useful. The colours remind me of blackberrying - Rich Razzleberry, Elegant Eggplant, Night of Navy, Old Olive - yum! 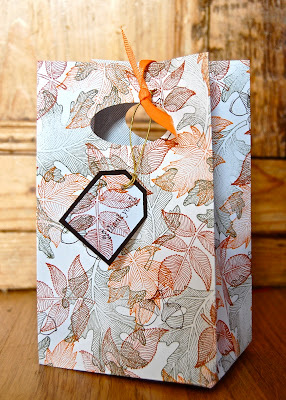 This bag was made out of a C4 envelope scored at 2", which makes quite a tall, square shape - the beauty of these bags is that you can make them pretty much any shape and size you choose. I used the scrumptious new Wild Wasabi green and the Medallion background stamp to decorate this bag-a-lope and I thought it was pretty effective. The handles are made from matching strips of card stock fastened onto the bag with silver brads. 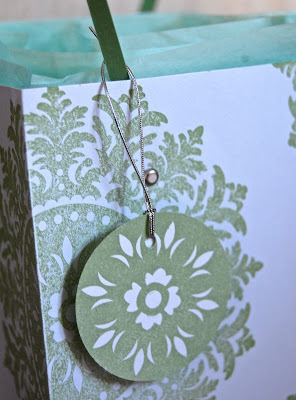 I stamped an extra Medallion onto a piece of Whisper White card stock and cut it out with the 1 3/4" circle punch to make this coordinating tag. Stampin' Up's elastic cord is perfect for attaching tags to your gifts as well as being very decorative in its own right! Here's a bag-a-lope which would work well for almost anyone. I stamped it all over with the Circle Circus stamps - and very therapeutic it was too! I used a variety of blues - Pacific Point, Marina Mist, Baja Breeze, Night of Navy and Not quite Navy - and it reminds me of blue and white china. I love using Autumn Splendor at any time of the year but doesn't it look gorgeous in its Autumn colours?! Always Artichoke, Cajun Craze, Pumpkin Pie and Chocolate Chip were used for this bag and the handle made by punching an oval shape into the top. I made a quick tag using an off-cut of the stamped envelope, some Chocolate Chip card stock and the large and small tag punches. These punches are so incredibly useful - they are an investment you will never regret. 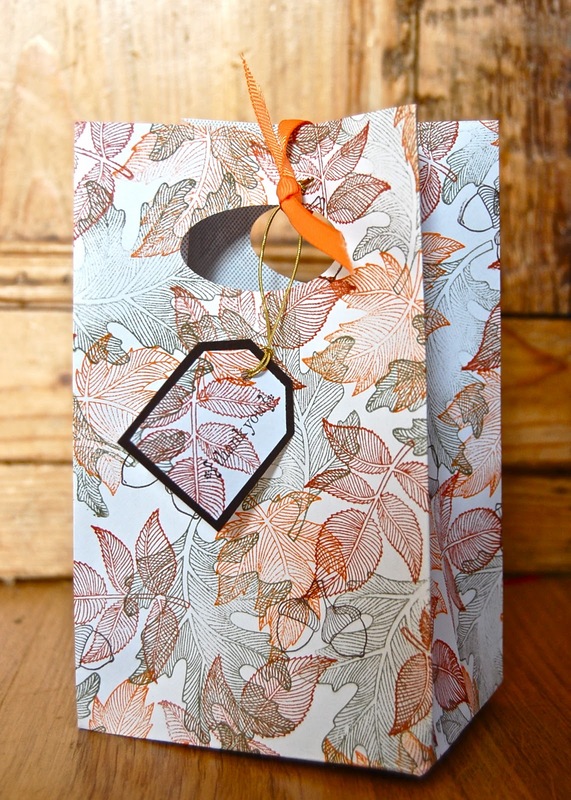 Here's another bag-a-lope inspired by all the beautiful Autumn colours we are seeing around us. 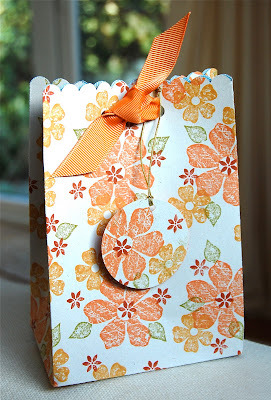 The top of this bag is scalloped like the first one but this time I made a tag with a circle punch. I think this 5/8" grosgrain ribbon looks magnificent in Pumpkin Pie and teams beautifully with the Tangerine Tango, More Mustard, Bravo Burgundy and Old Olive of the floral design. Well, I could go on for hours about bag-a-lopes but you've probably had enough now. I'll leave you to imagine the endless possibilities of what you might put in them! That reminds me of when my youngest son attended a fantastic music class for pre-schoolers here in Buckingham called Crash, Bang, Wallop! There was always a moment in the proceedings when my friend who ran the class would ask the children "what's in the bag?" The children would all guess what was in the bag and there would be suspense and excitement until all was revealed and a special song was sung about the contents of the bag! My son adored this moment and his guess was always the same. When the question was asked he would always yell out "bees!" with great confidence. Of course, it never turned out to be bees - a strange thing to imagine being in the bag - until my son's last day at the group when my lovely friend arranged for it to be bees (not real ones thankfully!) and my son was amazed and delighted. Sigh. I've gone to what my daughter calls Mumland. If you're still with me after all my ramblings, have a great Wednesday. I'll be back tomorrow when I'll have come back from Mumland and will be absolutely focused on producing a card in three minutes flat! All so lovely...don't ask me to choose which one I like best!! These are all fabulous Vicky. You have been a busy `bee` ha! I love Mumland, it`s something I often do too and it gets even better when there grandkids in the mix too. All beautiful, but the autumn leaves are my fave. the bags look awesome, Vicky! These are all just gorgeous Vicky I love your colour combos, I really must try to be more adventurous with my colour schemes!!! Love all your bag-a-lopes, Vicky, as usual. Also loved the "what's in the bag" story. You can go to "Mumland" anytime you want! These are all such terrific expamples of the bag-a-lope. All so different and all so unique. It's hard to pick a fave but I think it would have to be the blue one. The overall pattern you created is so interesting. What a fun memory for you and a fun moment for your son when he finally got his bees.